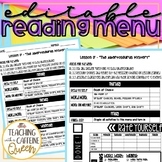 Reading Menu-Independent & Differentiated- Homework, Classwork, or Group Work!! 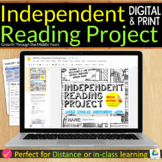 Use this independent reading menu to hold your students accountable while they complete independent reading. The menu checks for understanding before, during and after reading the book. 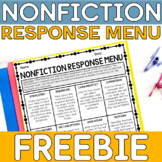 This is a versatile reading menu that can be used for independent reading assignments or as part of center rotations. It includes four categories with a total of 20 engaging activities that appeal to various interests. This is a simple, efficient way to differentiate instruction for your students! Summer Reading Menu: Make the Summer Count! This short pack includes two different reading menus. One is for fiction books and the other is for non fiction book use. This Reading Menu has all the jobs and leveled readers that go along with Dogs. Also, there is a place on the back to write a reading goal for each day. We use this as a guide and choice menu for the whole week. Reading menu for the book Quest for the Tree Kangaroo. Choice board for reading during small groups or centers.